It is the honor of my life to represent you as your Governor, and over the next two months I will continue to do so. As the mother of five, I know how to multi-task, and I will continue to promote the path of reform that we set out on together in the state of Alaska. 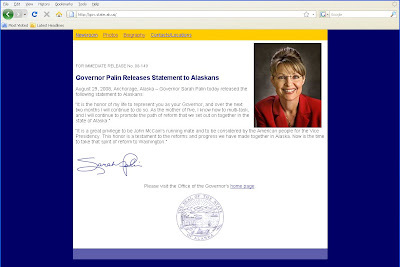 Of course, there are also a number of parody websites involving Palin, including this phoney blog purporting to be written by Palin, which uses hyperlinks and embedded video content to skewer both the governor and her husband. The Washington Post argues that the Internet has been critical to Palin's political success in "Palin Thanks Her Online Supporters as Interest Grows," which links to several online "draft" efforts. Many in the vlogosphere are already deconstructing the nomination on YouTube or using video editing software to focus of particular parts of her anatomy. Update: The appearance of the governor's home page has changed as revelations about Palin's family life upstage the convention. See the site for the "First Gentleman," however, here.